The ISP Technologies’ DAVID ELLEFSON Signature Model BETA BASS DSP™ is a Floor controlled Bass guitar system with a fully programmable super precision digital Bass preamp with Studio quality effects processing plus a built in full function precision bass tuner. This is not a modeling processor. The BETA BASS DSP allows the bassist to create the best tone possible with incredible flexibility. 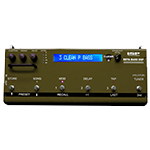 The preamp section delivers more tone shaping and flexibility than any bass processor available. Don’t settle for bass, mid and treble when you can have the world of BETA BASS. The ISP Technologies hardware design uses a novel stacked converter topology with 124db dynamic range between input and output. This incredible I/O dynamic range feeds a 32 bit floating point architecture with greater than 1500db internal DSP dynamic range. Add to all this ISP’s proprietary oversampled clipping algorithm and the result is the only digital preamp that can offer massive amounts of usable gain (more than any DSP processor available) with zero aliasing or noise. The BETA BASS DSP is not only the best Bass guitar digital preamp, but it combines stunning performance for any playing style from funk to jazz to blues to rock. Fully programmable, with a DSP digital software implementation of the ISP Technologies analog Beta Bass Preamp, the BETA BASS DSP offers amazing tone and distortion with zero aliasing typical in other digital preamps. The BETA BASS DSP also includes ISP Technologies’ new Decimator X Technology with the proprietary “Differential Integration” algorithm. Tuned for the Bass guitar, the algorithm provides silky smooth sustained note decay and super fast staccato tracking. The built in Decimator X for Bass also allows for mind blowing sustain with zero noise. The BETA BASS DSP has an amazing preamplifier section with multi-band full parametric equalization plus bass and treble with an adjustable corner frequency. There is also a Bass distortion section with mixing capabilities to blend the distortion tone with your clean tone and a separate post distort EQ section with full complement of post distort EQ. The BETA BASS DSP has stereo outputs for stage rigs to drive a power amp and typical Bass cabinets, plus balanced XLR outputs with selectable TRUE SPEAKER™ digital Bass guitar speaker cabinet emulation and a headphone output also with TRUE SPEAKER. ISP’s ground breaking TRUE SPEAKER is a departure from typical speaker simulated outputs, which provide a simple filter response. ISP’s TRUE SPEAKER provides convolved Bass speaker cabinet outputs providing the actual time domain and frequency response aspects of vintage Bass cabinets including adjustable microphone placement and reactance. With TRUE SPEAKER, the BETA BASS DSP is the ultimate direct recording Bass guitar system with the total realism of several different styles of Bass cabinets and a microphone placement. Another novel BETA BASS DSP feature is a phase manipulation Bass Exciter which provides unique sonic shaping with added air only possible with ISP’s Bass Exciter algorithm. Also included is a library of studio quality 32 bit floating point digital effects including wha wha, envelope follower, compressor, bass exciter, multistage stereo phaser, stereo flanger, four voice chorus, pitch shifter, 1200 millisecond delay, ping-pong delay and a stunning studio reverb with multiple selectable parameters. MIDI ports allow MIDI dump / load for archiving data plus MIDI program changes. There are rear panel inputs for use with both an external expression pedal for countless map-able parameters for on the fly control and a dedicated input for volume pedal. The BETA BASS DSP provides triple encoders for easy programmability plus 224 user programmable presets for user sound library storage. A SONG mode has space for 124 songs to arrange patches into songs for live performances. The BETA BASS DSP is designed and manufactured in the USA and is covered under US Patent 7,532,730 with other patents pending.